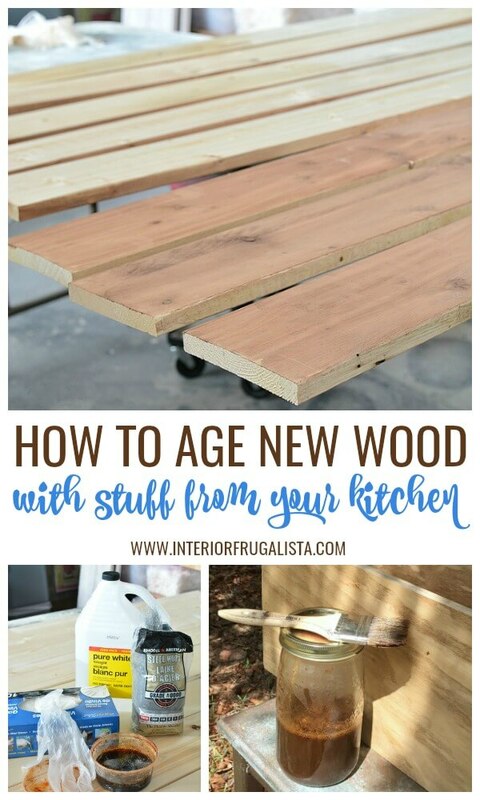 Did you know you can make brand new wood look like its been aging naturally for years? And the best part is that what you need to do it can be found in your pantry! It's an easy technique and you can watch the aging process happen before your very eyes. 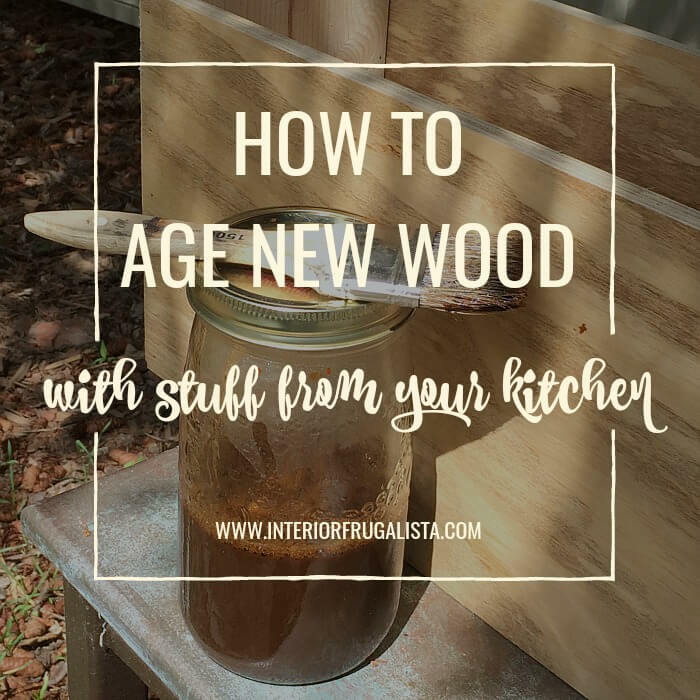 In this post, I'll show you how to age new wood with stuff from your kitchen in two different ways. I'm often asked this question when I've used this technique in projects posted on the blog. 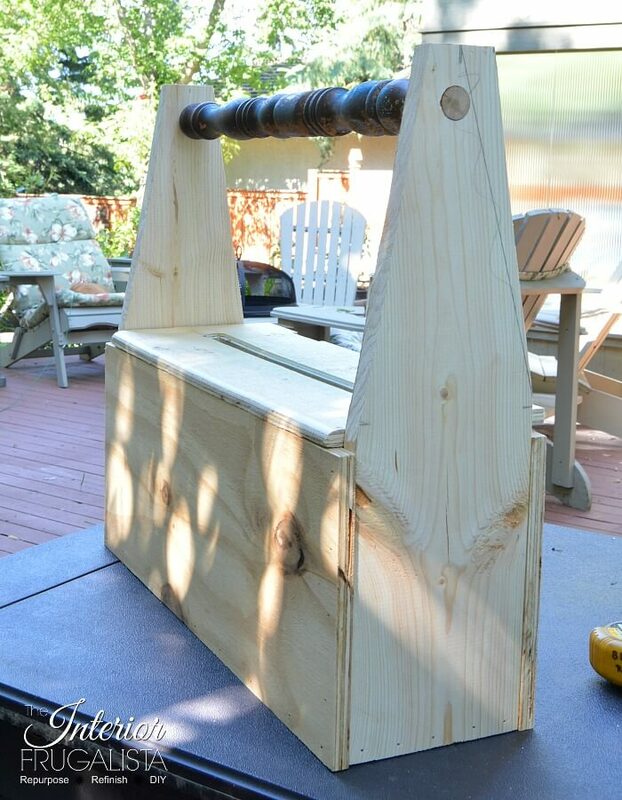 Instead of repeating the instructions every time I use it, I thought it would be easier for you guys to find the instructions in one dedicated tutorial post. I should point out that the resulting patina will vary depending on the type of wood. Use a container with a lid like a large plastic food container. Fill the container 3/4 full with White Vinegar or Apple Cider Vinegar (my preference). Submerge a large piece of #0000 gauge steel wool into the vinegar and close the lid. Let it steep for a minimum of 12 hours (I prefer a week). The longer the solution steeps and disintegrates the steel wool, the darker the stain. When the aging solution is ready to use, run it through a strainer into a clean mason jar or glass jar with lid. Brew a pot of black tea. My preference is Earl Grey because no sense wasting it all on wood. Steep the tea for at least 30 minutes to an hour. Pour the black tea through a strainer if you used loose tea. 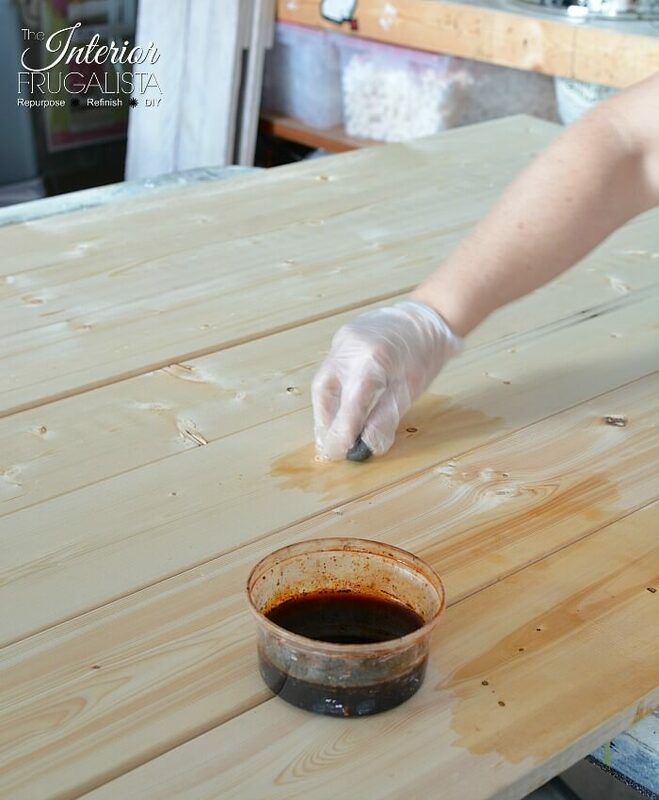 Brush the tea onto bare wood with an inexpensive chip brush and let dry completely. Wear rubber gloves because not only will it stain your fingers but the smell will stay on your hands for days. Ask me how I know. 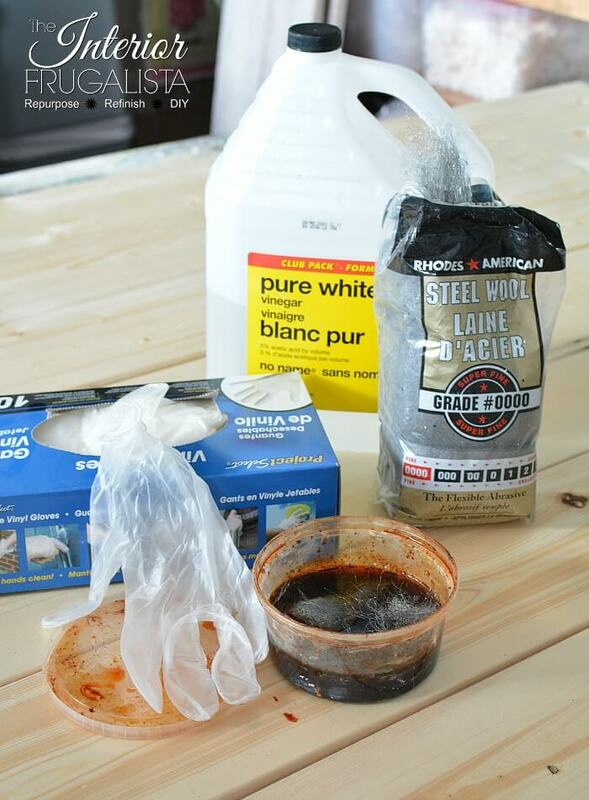 Brush the aging solution onto the tea stained wood with an inexpensive chip brush. Repeat with as many coats required to get the aged patina of your liking. 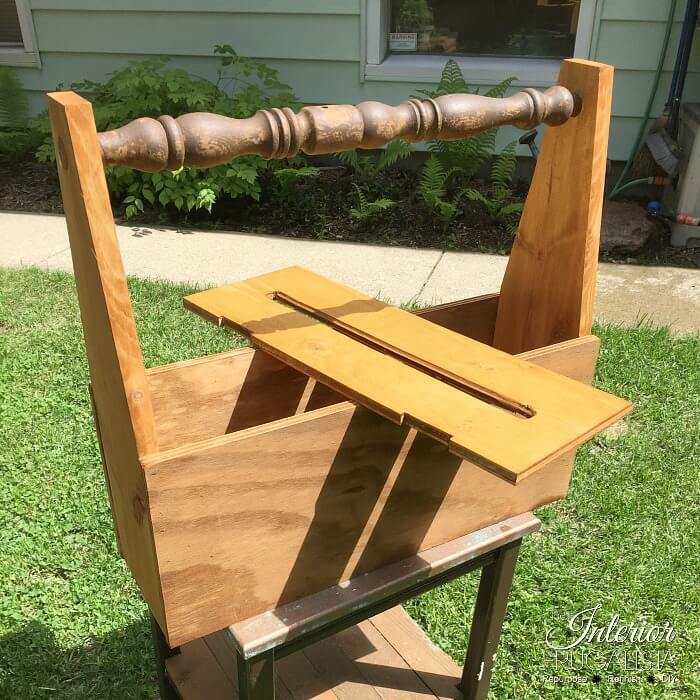 The acid from the vinegar reacts to the tannins in the wood and essentially provides an acid wash stain that creates that lovely aged patina. ...and after staining with the vinegar and tea aging solution. Again the patina will be different depending on the type of wood you use. The recipe is the same as the one above but skipping the black tea step. It really comes down to personal preference. 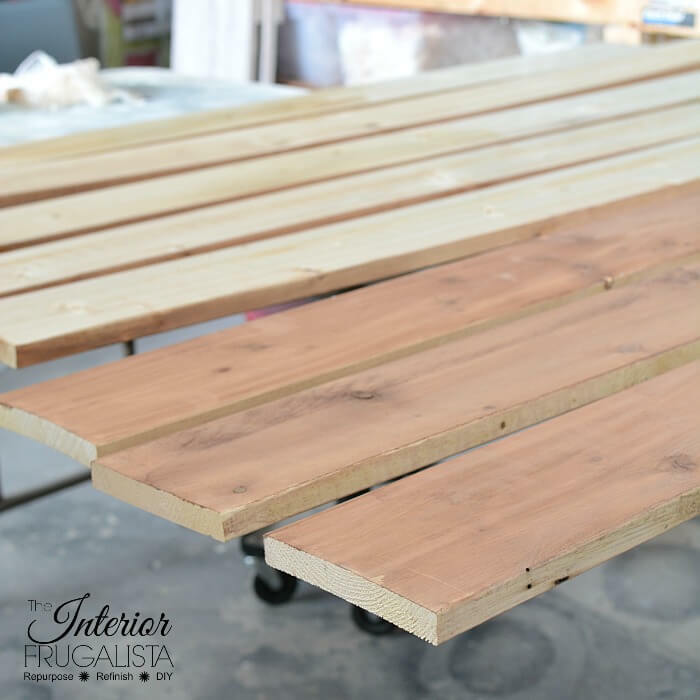 I suggest you try both methods on a sample board of whatever type of wood you'll be using for your project. 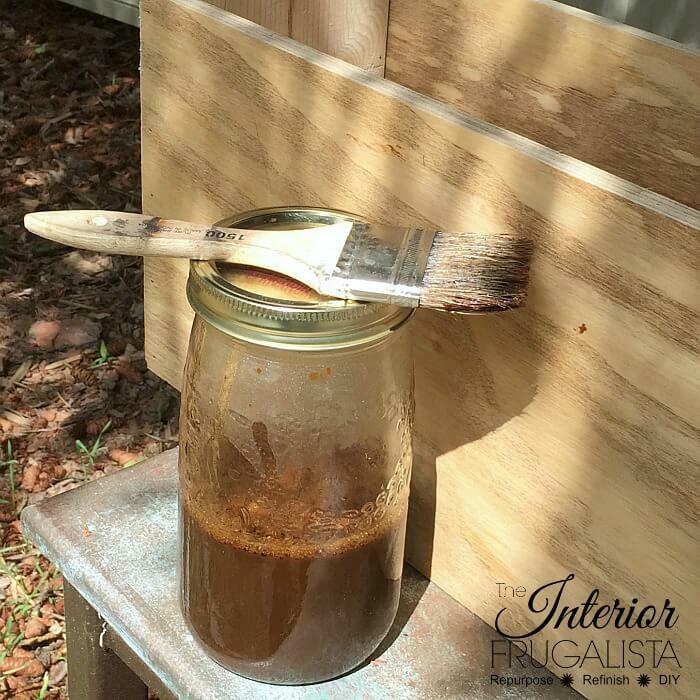 In this example using lumber for our Large Rustic Plank Wood Clock project, instead of applying the aging solution with a chip brush, I applied it with the steel wool remaining in the container. In the photo below you can see the difference between the treated and untreated wood. You'll notice the aged patina is lighter without the black tea. I hope you found this tutorial helpful. If you have any questions, please don't hesitate to ask in the comment section below or press the Contact Me button at the top of the blog to drop me an email. I love hearing from you! Great idea. I love the look of the wood with the tea. I've used it to stain paper but never thought to use it on wood! It works like a charm Virginia, you'll love it! Pine tends to go yellowy/orange but not so much on other wood types. I hope you give it a try. I heard of both these methods but haven't tried them yet. I did use 'tea dye' to age paper maps before tho and it worked amazing! Pinned for future reference! Thanks for the pin, Denise. I think you'd find this aging process fun! The tea combined with vinegar gives a darker patina. If you try it Michelle, I'd love to hear what kind of patina you get with the rooibos tea. I'm going to update this post after giving it a try, along with other dark teas because I'm curious. Thanks for the pin!